The Catholic Church has distanced itself from the Spiritual Director of the Adoration Ministry , Enugu, Rev . Fr. Ejike Mbaka , over his perceived politically charged statements . 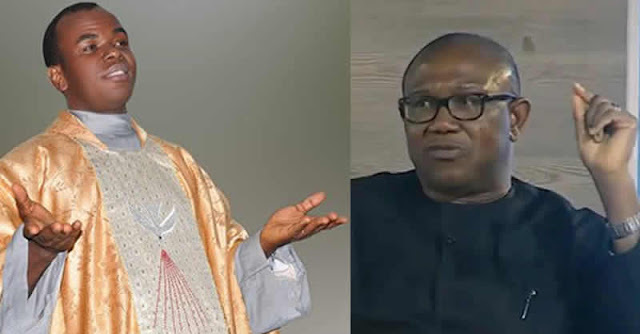 In a video that has since gone viral , Mbaka was seen telling the vice presidential candidate of the Peoples Democratic Party , Peter Obi , during the annual harvest and bazaar celebration of the church on Sunday , that neither the PDP presidential candidate , Atiku Abubakar, nor President Muhammadu Buhari of the All Progressives Congress , would win the 2019 presidential election . Addressing Obi in Igbo, Mbaka said , “( Former ) governor , listen , so that we won ’ t be deceiving God . As you are standing in the presence of these children of God , tell God what you will do for Him… It means you don ’ t want to do anything for God . "The way you and Atiku are moving will end in shame" The verdict according to Father Mbaka! I have tried to avoid laughing seeing the clip for the first time but I ended up laughing and laughing so hard...but this is not funny at all. Ha! Father! Biko, temper justice with mercy.. But the Director of Communications , Catholic Diocese of Enugu, Rev . Fr. Benjamin Achi , in an interview with The PUNCH , said the diocese was not in support of the cleric ’ s remarks . He , however , noted that it was wrong for priests to make political statements from the pulpit. Achi said , “ The diocese is not in support of any priest making political statements . “ The church is supposed to be apolitical and the Bishops ’ conference has said that repeatedly . “ We are not supposed to make any political statements from the pulpit within the context of Mass, that is , church service . “ So , it would be wrong to stand at the pulpit to make any political statements . “ There is a document issued by the Bishops ’ conference to that effect . Achi noted that if necessary , disciplinary action against Mbaka would be carried out by the priest ’ s administrative head .